H2 and KJ now openly talk against Father. Father was still alive when they started. This was the origin of their conflict with the leaders, that ended in conflict with TM. Not willing to admit their false understanding, they turned into negativism and resentment. In the last video H2 called Father's tradition of Tithing - Satanic.. and accused the way Father structured our movements as Totalitarian. What!! And he has eyes to accuse Mother for changing things. How can Sanctuary Church lie to us, that they love Father? Hyungjin is Father's biggest enemy. At the end of another sermon HyungJin said that Father gave us the word “I as a owner of CIG.”, and then he makes a mockery of FFWPU pledge, that according to him is to recite “I as a slave of CIG." This guy has no respect for his Father.. and that's becoming more and more obvious with each next sermon he gives. Both with his brother, KJ, they helped Japanese members build up resentment concerning all of their donations over the years. What hypocrisy, H2 claims to love TF, yet works do accuse Father's work. What they do is listen to the negative, invaded members, believe what the evil sp.w. talks through them, so they too got invaded. Than multiplying it. So they are now going so far as to accuse all Father ever did. You see the 4 fallen natures all over this process. Even worse; KJ and H2 say that those not attending H2 have lost their Blessing and are now of fallen lineage. This way, they deny Father's Blessing.. saying it's false and meaningless. They call True Mother fallen, thus denying Father achieved his mission to restore a Perfect Woman and give rebirth to humanity. Well, without TP, there are no True Children. So H2 denies his own credibility. At the 40th Anniversary, 1994, Father gave 'The Family Pledge'. In 1995 the Wilderness period (45-95) was over and he established the Family Federation and instructed us to take out the Church sign. In Father's words, "The Era of Religion has ended" and we should "Transcend the realm of Religion." National Leaders were puzzled when H2 and KJ were going around and spreading another teaching. They tried to convince the leaders that FFWPU logo is not nice, instead we should become "Tongil Gyo Unification Church." When leaders said that Father's direction is different, H2 was displeased and argued that "Revelation is on going process", so we should not listen to Father. What! Father was still alive. At that time H2 already misused old words of Father to rearrange things in his own way, against Father's more recent changes. He was doing this behind Father's back, but using True Parents' name to claim credibility. Such documents are now coming out. Don't be fooled, H2 started many manipulations behind Father's back, while Father was still alive. Yeona herself, in her gossiping video, shares of H2 entering in conflict with Mother and how Mother already was aware of the danger. H2 only pretending to be faithful until Father was gone to show his full socipathic nature. SC claims that Father loved H2, so instead of him following Mother, she is obligated to love and support him. But while Father was still alive H2 often used Mother to press Father for what he wants. Hyungjins' evil games did not suddenly started afterwords. Few leaders shared in the European Leaders meeting about such past experiences, with concrete details. Obviously H2 was just pretending to follow Father.. Saying publicly that he obeys TP, but behind Father's back.. he had agenda against Father.. which now becomes more and more obvious. Even though H2 still lies (even to himself), that he loves Father as facade, we can see how theologically he destroys one by one all Fathers teachings.. it's visible where that leads. Now H2 reduces Father to just the level of Jesus (Failed Messiah - who couldn't restore family, so couldn't give True Blessing.) That's why H2 has to Bless you, otherwise you are not blessed. But you notice the false logic; How can H2 be TC if TP were not victorious? You see; the more untruths they accept, the more strange rationalizations they have to devise to excuse it. So it becomes like endless rational trap - Hell that they are more and more building up in their minds. Be sure there is spiritual powers behind. In psychology sociopaths and psychopaths are the same. They are narcissist who aim for power by any means, re-crafting the logic to destroy the opponents on the way, without any sense of remorse, because they lack empathy. Because of their manipulative nature, they are usually at the top of banks, politics or religious organizations. It is scary to see how many spirits work under centralized command to manipulate the bodies of every member. Not just Sanctuary Church. It's a war inside everyone of us. H2 and Sanctuary Church are just external projection of what happens in each and every one of us. Once you start listening to them, they can trick you and manipulate you into any believe. How do you know someone is under control of manipulative spirits? He will display many sociopathic trades.. and you will see that he is doing it without empathy for those he accuses. That's the very difference between SC and UC. We feel pain hearing H2's negativities, while SC clique feel uplifted. We feel horrified of how he labels Mother names, SC feels joy and liberation. Such feelings are from the evil spirit world.. sign of obsession. Manipulative spirits will pretend anything to make you follow them. Making you forget what you knew previously. They pretended to be Father and mislead H2 against all that is precious for God. These are the most powerful manipulative spirits in history, he is dealing with. Only very good sense of DP can help overcome them. This is serious - we have to learn how Satan works, by studying and observing that. • Both have charisma or charm that they use to get people manipulated. • Both tend toward grandiosity – big ideas, big stories, big self-centered visions. • Both lack empathy; narcissists are unable to see things from another’s point of view and sociopaths can see how they effect others but just don’t care. • Both can skillfully re-craft the past to suit own needs. Sociopaths are good at imitating emotions... using them to manipulate others. What kind of love is to call his mother names? But H2 makes with vigor, humor and other methods - to ridicule, recreate his trapped emotions in SC without them noticing, yet make them consciously feel uplifted. I was dealing with psychopaths and was always amazed how no one notices how evil is what they do. Instead people who get manipulated think this guy is great. On subconscious level their methods work like hypnosis. But the real power and skill comes from the evil spirit world working through this person. They are the real Psychopaths, they are the monsters controlling hell and influencing the earth under evil Angel's command. They are the Dark Force we have to win against. That's why they are so skillful, you don't notice what actually they are aiming and doing to you. "When God looks at the world he only sees the king, He doesn't see everybody else...." KJ's words. Very, very Narcissistic! This exaggerated sense of grandiosity and entitlement is characteristic of Sociopaths. They are very Narcissistic. Notice how SC are brainwashed to see HgJN as King, god.. The book, "Wanderer in Spirit Lands" explains how such powerful spirits dominate each area of Hell. So we see what spirits are to be liberated.. They are powerful manipulators. Able to manipulate numerous people in their lies... even if what they teach is the reverse of God's Truth. H2 so skilfully re-crafts the past to suit his purpose of destroying his Mother. Few rumors of what happened, few misinterpreted words of Father mixed with his sick, selfish ambitions... and voila... you got perfect manipulation. Evil from the core of its motivation, process and implementation.. total incarnation of all Satanic ways of manipulation. Seems like he is expert in doing that. But without the evil power behind, that will not be possible. Manipulative spirits have many different methods of capturing their prey. The more one gets involved in their rationalizations, the more his mind gets blocked and fixated only on what makes them negative. This neurological trap in the brain, cannot let them go. Their heart is not free, Original Mind is blocked, so God and good spirit world cannot help them now. I hope you understand my heart is crying, feeling the agony of God and the good spirit world. No matter how pity and ignorant I am, they want me to find the way to liberate those people. They are our brothers and sisters. You can notice how evil spirits use even the original mind of HgJN to trigger his trapped emotions of resentment. H2 talks of loving Father, but the next moment accuses Fathers rules as Totalitarian, and the organizational structure Father created, as Evil. That's because all neurological connections now are re-wired in his brain to these dominant painful feelings, leading to resentment. You will see the signs for that in his sermons; whatever he starts to talk, he will end up in the same negative, destructive trap. His mind is not free. His OM is prisoner of the Physical Mind. Unless you win over these evil spirits, there is no escape. Each attempt of the OM will make them tide the knot even stronger. In this state feelings are not real, they are product of the Physical Mind, under the control of evil spirits, dominating you with displeased feelings.. to church, to Mother, to whatever.. just to keep you in this hell. We could stop gossiping in my country, using Father's victorious V.O.C. model.. Why not stop it on world level with the very same model? We just have to understand how evil works and stop it. TRUTH LIBERATES.. TRUTH IS LOVE. We have to divide good and evil with the Truth. Make it clear and visible for everyone. Father didn't hate Communists, he reviled what's wrong in the ideology and the evil methods.. thus he liberated the people. But we have one more powerful tool now - the AGS. Over 500 billion Absolutely good spirits. We should learn to mobilize them. DMN was coming from the spirit world, guiding me to reveal how the physical phenomena reflect the reality of the sp.w. DMN showed me spiritually how such manipulative spirits invade the brain; use past painful memories, influence the analytical part of the brain, dominate the feelings - pushing people in displeased feelings against others, making them resentful and thus turning them into evil spirits, like SC had already become. In this age of CIG all this evil comes down for the purpose of resurrection. Who is to liberate them with the Truth, but us.. who know the Truth. Humanists think that saying the truth to a person who does evil, will hurt him. That's because they don't see that this evil is done because the person is acting under the power of evil spirits. Hearing the truth of his own actions, empowers the original mind of the person to stand against that power. Even more, Truth allows the good ancestors of the person to take over and push the evil spirits aside, because now is clear what's right and wrong. Ignoring H2 is not love. Some say, "give him true love by ignoring him." Wow, don't do that to your children. Ignoring them when they do wrong is the worse you can do. That's humanistic thinking. Playing blind to their wrong doing is like saying they can continue doing it.Those around H2 should be the first ones to correct him. Father knew all that beforehand! He blessed H2.. and in each prayer he said, H2 will become evil, become resentful... Father even encoded in DP, that it will happen after 2013 and that this is the age of Mother-son relationship to be indemnified and restored. Father even said, if H2 denies True Parents we should not follow him. So he knew that may happen. He educated H2 for 8 hours to prevent that. In fact, it is good it happens, because we have to see how far things can go if any future generation decides, they have revelations that True Parents failed. Father told us so many times that the position of True Parents is eternal and most precious.. that there is only one set of True Parents, we all have to inherit their model and tradition. Whoever denies that and starts changing principles and traditions as H2 does, will become the worse betrayer in history. "Because of my mother there is no confusion regarding succession", said H2 after 8 hours education by Father. Now H2 changed on 180 degrees, turning against everything Father ever said. Father specifically instructed him, that "If he, or any of TC, or any future generation, denies True Parents, we should not follow them. But H2 turned against Father and decided to destroy the image of Mother, destroy any faith in True Parents, even by denying all Father's words, instructions and traditions. Q: When a religious leader dies who will succeed him. What is the situation in Unificationism? Are preparations being made for the procedure of succession? A: Yesterday, I talked with my father for eight hours. My father is healthy. As long as he is here, he is the top decision maker. If he is not here, then my mother is the top decision maker. Because of my mother’s presence, there is no confusion regarding succession in Unificationism. Yes, yes.. Father educated 8 hours H2 that Mother is the center until she is alive. Did H2 forgot that? Father also said, in 2008 " there was no one who surpasses Hyung Jin in his standard of faith towards True Parents." Well, that changed! In 2013 he H2 lost his faith. He turned against his center - Mother. In 2015 he started openly spreading rumors and gossiping, multiplying his Trapped Emotions. In 2016 H2 is already the biggest enemy of Father; openly teaching Father's ways are satanic. But in fact, H2 and KJ are working for Satan to destroy True Parent. That's not them, that's evil spirits, manipulating them. How come the successor has the right to deny Father and deny TPs. And how that can be called 'faith' or 'filial son'? And how do you expect us follow a sociopath, who constantly talks against Father. What "Successor" - Tell me about it !!! But for those who has already bought into Hyung Jin's drastic assertions.. such a person is willing to accept the "worst" possible translation _and_ interpretation H2 makes, yet be blind that it is a complete reversal of what Father actually said. What that tells you? It's a spiritual block, blinding them - Evil Power, behind this SC phenomenon. It always amazed me how Father explained things simple and clear, to liberate our hearts. When I practiced it, it always turned out to be true. Every spiritual level I reached, I realized he was there. It was his unique attitude that helped every spiritual victory I reached. Father always amazed me. Psychopaths are just the opposite.. they surprise me with their irrational rationalizations. Crazy.. Hellish.. Narcissistic.. full with negative resonance. Their words resonate only with our Evil Mind. Pushing, pushing.. to make us be negative against others. But Father's words always spoke only to my Original Mind... always elevated my spirit.. taking me out of any negativity and narrow-mindedness.. opening my heart to love and live for a higher good. The vast majority of Unificationists are perfectly happy with True Mother, glad she is confidently asserting herself with wonderful Motherly Heart. We are inspired by her motivation for witnessing and fast establishment of Nations under the ideal of True Parents - things that SC does not care for. We love the fact, that Mother keeps this loving heart, without changing the Unificationist culture that Father established. As for the SC, we cannot even recognize them as having anything with Father's tradition and teachings; they think strange, act strange and talk strange. Nothing to do with Father. they think negative, talk negative and act negative. That's all to do with Satan. Pity and painful. We pray for them, but God wants good and evil divided, for they are blocking God's providence with their constant negativity and resentment. It is God who has to be liberated. The True Family is just taking the burden to liberate this hell, liberate God and humanity, because we didn't. Therefore, Pray for the evil spirits and the evil angels to be liberated and restored.. and the last evil person restored. Only then The True Family will be free too. There are 2 types of negative people... Those who spit at everyone (complete pessimism), and those who spit at the opponent, like H2 (Sociopaths climbing for power). We reveal the satanic nature of both... because such resentful people need to understand what's wrong with their attitude. They surely also have Original Mind that needs to be liberated. Great work. 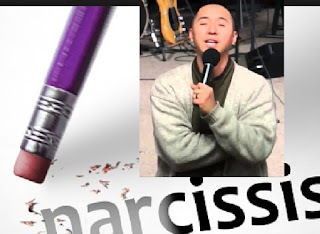 I agree that HgJn is narcissistic. Sadly, that doesn't stop people from following him. There's also a lot of second gen members who, through no fault of their own, have a foot in both camps. I know one young man whose wife's parents are big time H2ers, but his dad is a loyal UCer. I guess most of us already know about another case: Jim Stephens coming out in support of H2 when his own son is a vp of Family Fed. Few leaders shared in the European Leaders meeting...with concrete details.. Father was still alive. Obviously H2 was just pretending to follow Father.. Saying publically that he obeys TP, but behind Father's back.. he had agenda against Father.. which now becomes more and more obvious. Even though H2 still lies, that he loves Father as facade, we can see how theologically he destroys one by one all Fathers teachings.. it's visible where that leads. Now H2 reduces Father to just the level of Jesus (Failed Messiah - who couldn't restore family, so couldn't give True Blessing.) That's why H2 has to Bless you, otherwise you are not blessed. Much of Hyung Jin's teaching emphasises the individual in front of the whole. Not DP. Pity, I can't lecture them directly.. But of course, such people are like the Middle spirit world, "you feel like their restoration will take forever", Dr. Lee explains. Whatever you say, they reverse it against you - full with negativity and skepticism. Please study Dr. Lee's explanations and notice the similarities with SC attitude. I don't give reference for KJN's criticizing Father.. because it's easy to find it in their recent videos. I don't want to advertise such satanic stuff. In fact, first third of the video was inspiring. I thought, finally a video without negativity. But the second 2/3rds suddenly H2 started spiting at everything Father did. He didn't say Father, but called satanic one by one all things Father created. H2 is all messed up. Sad to say! i couldn't find the part where talks against tithing. I did see a lot of John Birch Society-inspired stuff about the International Banking Conspiracy though. You know, maybe it's a good think that HgJN broke away from TM, because if he and KJN stayed the course and took over, we'd REALLY be in trouble. Evil is sly. They will mix truth with lies so that the lies seem to be truth. First give inspiration and truth then (the real purpose) throw in some important lies that seem so true. Those lies attack goodness. When HJN went on his "listening tour" all across the country, after the demise of LL (listening for hours and hours of complaints and vitriol) surely that HAD to have some impact on his psyche, dontcha think? Maybe he stored up all that "resentment" for our sakes, and now has to digest it. Been praying about this for a long time. Tfam always, it seems, has to carry the load for us. Coincidence? Listening invaded people, the same evil spirits invade him. I see that all the time how evil spirits invade when someone shares freely his fallen nature. Because the evil spirits are talking in that moment... it's not the original mind of the people. But H2 does not understand that. All his sermons are based on negativities he so eagerly collects from the whole world.. And SC is proud of that. They should be ashamed and repent. Very good message, strong and straightforward. I especially like the first point, about how H2 has turned against Father and all Father's directions and works. I liked all of it, including the narcissism, the exposing evil spirits, etc. Keep up the good work, shining the light of truth.